Black bean brownies have made their rounds in the diet circuit for years and more recently have popped up on vegan blogs. I'd never been much attracted to them but then my good friend Tara insisted I try my hand at a healthy vegan version. Oh, my! Why didn't I listen to Tara sooner? 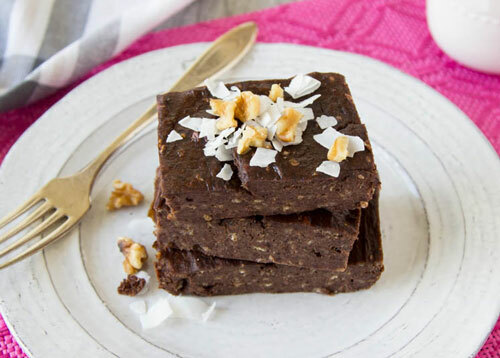 Dense, fudge-y and ultra-healthy, these brownies are a great alternative to traditional brownies! It's amazing how they taste like chocolate and fudge and not beans! Chef's Notes: Rolled oats run through the food processor may substituted for the instant oats. Use optional sugar if your bananas are still green and not very ripe. Preheat oven to 350 F. Grease an 8x8" pan and set aside. Combine all ingredients, except oats, in a food processor or blender and blend until smooth, scrapping sides as needed. Stir in the oats and pour batter into the pan. Bake approximately 30 minutes or until a toothpick inserted in the center comes out clean. Allow to cool before slicing. 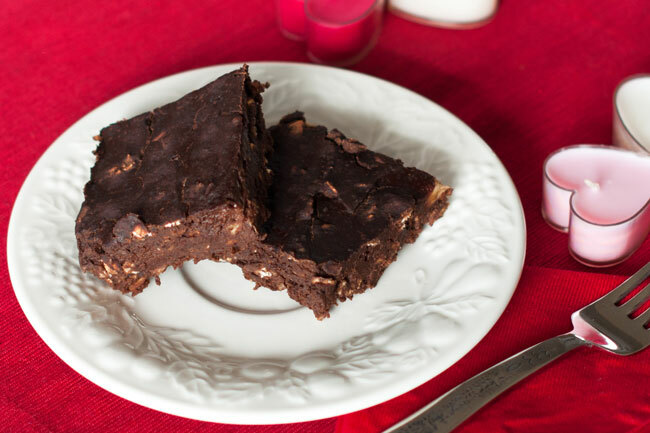 Chef's Note: if you find these brownies are too soft or too fudge-y, add another 1/4 cup oats or flour.